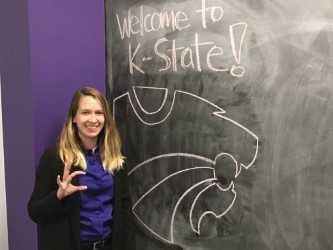 Recruitment coordinator Danae Daellenbach is ready to welcome future Wildcats to campus. The College of Education has finalized its list of Ed Experience dates for prospective students and now we need you – our amazing alumni – to help identify students who would be great teachers. Prospective students will spend the day with a College of Education ambassador, attend classes, meet with an academic advisor and visit with Danae Daellenbach, the college’s recruitment coordinator. “We are very excited to welcome prospective students to K-State,” she said. For more information about the activities and full calendar, please visit Ed Experience days. For questions or to schedule an individual tour, please contact Daellenbach at kstatefutureteachers@k-state.edu or by calling 785-532-5524.